Home / data conversion services / maxbpo / maxbpos / outsourcing data conversion services / What is the difference between data conversion and document conversion services? Let us look at some advantages of the same. Based on your need and processes, you may be converting data or documents. Now, is that different? Is data conversion not the same as document conversion? Well, it is not. There is a substantial difference in the two. 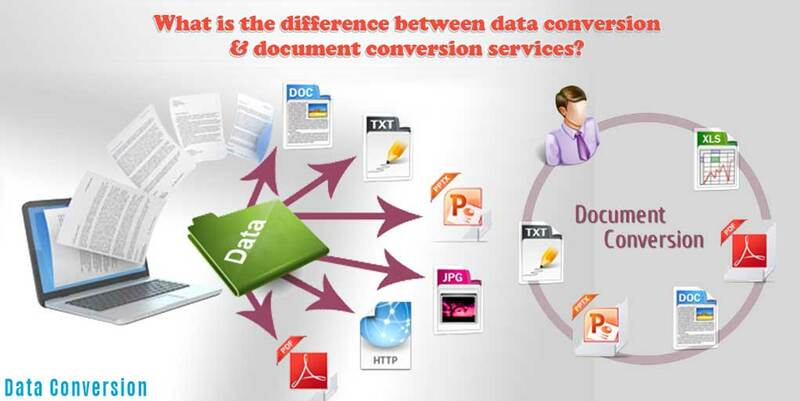 Let us explain what data conversion is and what document conversion actually means. Data conversion, specifically, refers to the conversion of one format into another. Let us explain this in some detail here. In the digitalised world of computers, data can be encoded in a number of different ways. e.g. Computer hardware is built based on a certain standards and operating systems are designed to handle certain data and file formats. As each operating system handles data in a manner different to the other, it is imperative that you change data formats when using a different operating system or a program. This means that any variable changes require you to custom convert data accordingly for us as desired. For data conversion services, a range of software may be used as this is not a manual process. The complexities may vary based on the data formats and operating systems involved. Data is read and processed by the operating systems and applications in varied manners, which means that when you want to use the same data for a different operating system or an application, data must be converted to the required format. Converting a document from one format to another requires the documents to be converted to a digitalised format. Let’s say you have some handwritten data or typed data in a printed format or let us say you have scanned data, and you would like to convert it to a usable format for analysis on a digital format. That would be termed as a document conversion. This ensures the data is structured and organised for use. As an organisation, many firms are now outsourcing data conversion services and document conversion services to outsourced units. Data conversion outsourcing relieves you of the stress related to the processes and allows you to focus on your core business tasks, thus giving you more space and time to work towards your business goals. The data conversion company employs experienced resources to complete the tasks in a specialised manner, and thus are able to provide quality services in document and data conversions to firms globally. The investments in technology, assets and resources made by the service provider helps relieves you of that investment too while still being able to reap the benefits. This result in multiple gains for the outsourcing firm over a period of time and can be termed as a wise decision for the larger good of the business.